3 New Rock Band Song Packs are now available to download from the Xbox Live Marketplace. For more information on "Rock Band" be sure to check out the 360-hq games database for more information.. Just follow the links. Dash Text: [ESRB: T (Teen) MILD LYRICS,MILD SUGGESTIVE THEMES] Build your Rock Band library by purchasing this song game track. *"Ten Speed (Of God's Blood and Burial)" is a cover version of a song made famous by Coheed and Cambria. PLEASE NOTE: Many Rock Band song game tracks are available as both a multipack and as a single game track. These song game tracks are exactly the same (unless expressly noted as a special version or remix). Be aware that it is possible to download the same song game track twice so please carefully consider your purchases. For music credits, visit www.RockBand.com. There are no refunds for this item. For more information, see www.xbox.com/live/accounts. Dash Text: [ESRB: T (Teen) MILD LYRICS,MILD SUGGESTIVE THEMES] Build your Rock Band library by purchasing this song game track. *"Working Man" is a cover version of a song made famous by Rush. PLEASE NOTE: Many Rock Band song game tracks are available as both a multipack and as a single game track. These song game tracks are exactly the same (unless expressly noted as a special version or remix). Be aware that it is possible to download the same song game track twice so please carefully consider your purchases. For music credits, visit www.RockBand.com. There are no refunds for this item. For more information, see www.xbox.com/live/accounts. Dash Text: [ESRB: T (Teen) MILD LYRICS,MILD SUGGESTIVE THEMES] Build your Rock Band library by purchasing this song game track: "Siva"--Smashing Pumpkins. PLEASE NOTE: Many Rock Band song game tracks are available as both a multipack and as a single game track. These song game tracks are exactly the same (unless expressly noted as a special version or remix). Be aware that it is possible to download the same song game track twice so please carefully consider your purchases. For music credits, visit www.RockBand.com. There are no refunds for this item. For more information, see www.xbox.com/live/accounts. Official Avenged Sevenfold Xbox 360 Controller Now..
Rocksmith 2014 Edition Coming For Xbox 360, PlayStation,..
Xbox LIVE Desktop Gadget v0.4 for WINDOWS 7, VISTA and..
FREE Custom Xbox LIVE Gamercards for Xbox 360 now on..
Rock Band 3's Fender Squier Guitar Priced $279 USD -..
Rock Band 3 Out Now on Xbox 360 - The keyboards, the..
Miley Cyrus Debuts On Rock Band Tomorrow for Xbox 360,..
Ozzy Osbourne Thrashes onto Rock Band June 15 with Six..
Lady Gaga Makes Her Debut on Rock Band! Alice Cooper Six Pack hits Rock Band Music Store May 19,..
Rock Band DLC Announced for Tues April 7th - DLC Track..
How to NOT Sell Rock Band on EBay! How Far Will LEGO Go??? Rock Band 2 Leaks More Songs? RUMOUR: Guitar Hero: Guns N' Roses for Xbox 360??? Guitar Hero Not All About The Guitar? Guns N' Roses and Velvet Revolver Frontman Slash to..
Rock Band 3 Fender Guitar, It's nice but pricey. FOR SALE: Rock Band 1 Drumkit + Upgraded Pedal! 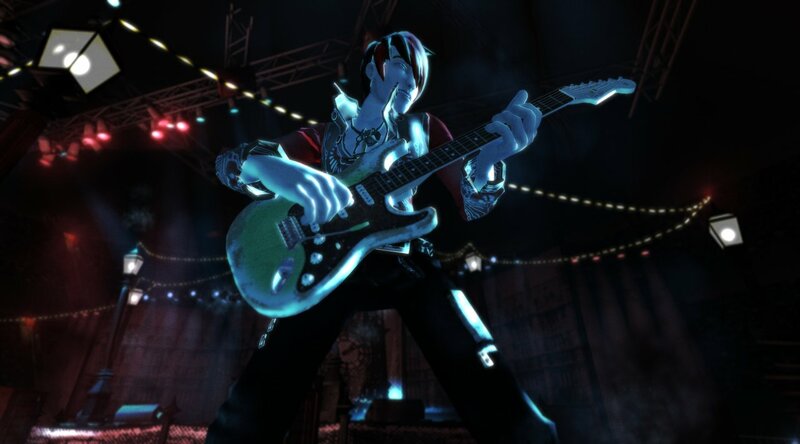 “Rock Band 2” will allow gamers to continue to perform music from the world’s biggest rock artists with their friends as a virtual band. All your original Rock Band 1 down-loadable content will work just fine in Rock Band 2, there is no DRM and no fee to transfer the music tracks. With all your old tracks and the new tracks for Rock Band 2..
Rock Band returns with another iteration of the popular music game featuring new songs and instruments. Rock Band 3 will have you rockin' out in no time. Rock Band™3 is the next generation of the ultimate social and interactive music gaming platform developed by the category's leading pioneers, Harmonix Music Systems. Featuring innovative g..
“The Beatles: Rock Band” allows fans all over the world to pick-up the guitar, bass, mic or drums and experience The Beatles’ extraordinary catalogue of music through gameplay that takes players on a journey through the legacy and evolution of the band’s legendary career. In addition, “The Beatles: Rock Band” offers Beatles fans the opportunity to ..
Dance Central™, exclusively for Kinect™ for Xbox 360®, is the first real dance game experience that is fun, social and for everyone! Brought to you by Harmonix, the developers who created the world-wide blockbuster Rock Band™, Dance Central is the first immersive dance video game that features and tracks full-body dance moves. Completely free from .. Released exclusively through Wal-Mart, the first band-centric game from MTV and Harmonix focuses on the legendary Australian rockers AC/DC. Will you get your rock on?..